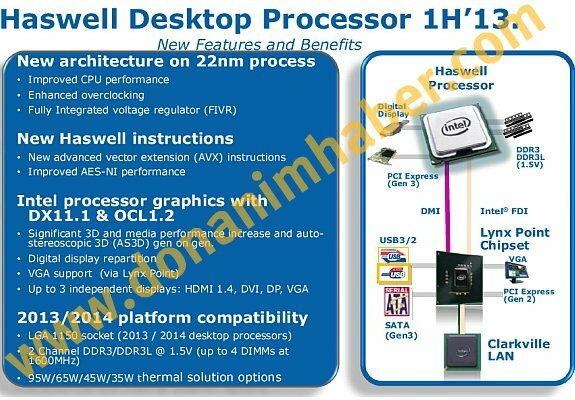 The Tech Report dug up new details about Intel's Haswell architecture at Turkish tech site Donanim Haber. The leaked details reveal the new chip will have integrated graphics with support for DirectX 11.1 and OpenCL 1.2. Much of the information on the slide has already been churned out by the rumor mill. Haswell will purportedly have integrated PCI Express 3.0 connectivity, its integrated GPU will have a trio of digital display outputs, and the accompanying Lynx Point chipset will offer third-gen USB and Serial ATA ports. The CPU will slide into an 1150-pin LGA socket, and it looks like that socket will offer an upgrade path to Haswell successors released in 2014. The slide specifically mentions "2013/2014 platform compatibility." Rolling out new processors with the same pin count as the old ones doesn't guarantee motherboard compatibility. Voltage standards can change, and older mobos aren't always capable of properly delivering power to new CPUs. It would be nice if Intel worked things out with motherboard makers ahead of time to endure Haswell's replacement will work in all Lynx Point motherboards.